The kitchen is the heart of the home. It feeds us and is the gathering place that brings us together with our friends and family. What is the message your kitchen is sending to your family and guests? Is it time for an update? If you are considering kitchen remodeling in Johnson City and Tri-Cities area, you may be happy to learn that by using the cabinets you already have, you can literally save thousands of dollars instead of buying new cabinets and having them installed. The icing on the cake in this decision is the fact that painted cabinets are the “in” and stylish way to go. In just about every magazine and dream kitchen book, it is painted cabinets. All of the “big box stores” have their painted cabinets front and center. 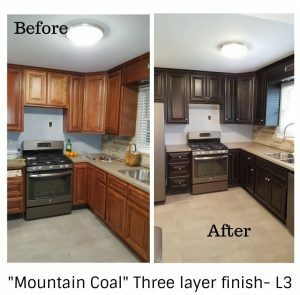 If you are in the market for kitchen remodeling in Johnson City and you decide to have your cabinets painted rather than replacing them you will spend about 75% less on remodeling than you would spend on new cabinets. As an added benefit you will have a stylish new look that will last for years! Vintage Chic Painting offers a range of finish options for kitchen remodeling in Johnson City. A “straight paint” can give you a bold stylish color or the very popular option of a cool or warm white. Painted cabinets with a glaze can lend itself to many options and give a custom designer look. We offer many finish options that can transform your kitchen to something right out of a high end decorating magazine. 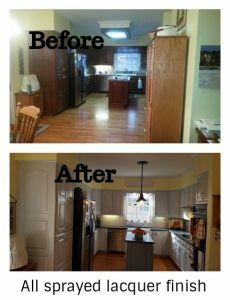 A real life example of how this can be a cost effective option for kitchen remodeling in Johnson City and give stunning results follows. Vintage Chic Painting recently worked on a kitchen remodel for a client. She had brought in a sample board from a local “big box store” and asked, “Can you do this exact finish on my cabinets?” The answer was yes, definitely! The sample board of the new cabinets for sale in the store was a black finish with a glaze, with distressing. The cost of the new cabinets were $315 a linear foot, plus the cost of tearing out and removing the old cabinets, and installing the new cabinets. The cost of purchasing the new cabinets for her kitchen was over $12,000, add the other costs involved and she was looking at around $19,000 for the look she wanted. (With new cabinets everything would have had to be torn out, even the counter tops). For less than one fourth of that cost, she got the exact high end look she wanted, and was able to keep her counter tops. We can match any finish from a store sample board, photos from Pintrest, or the same looks you see in design magazines. 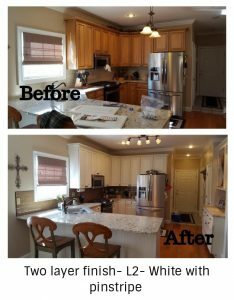 She estimated that by having Vintage Chic do a new finish on her cabinets, she saved over $15,700!!! With those unexpected savings she was able to get all new appliances which she didn’t think was possible. Whether you want a clean fresh updated look with one of our basic straight paints or something like the very popular farmhouse look, we can easily help you achieve the look you want and save you a ton of money in the process! 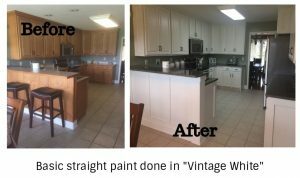 If you are considering kitchen remodeling in Johnson City, you owe it to yourself and your budget to get an estimate on cabinet painting from Vintage Chic Painting. Estimates and consultations are free, along with custom color development. While it is an investment and not a cheap fix, choosing to refinish your existing cabinets can be a very cost effective solution to an incredible new kitchen. Call Donnye Phillips at (423)557-5097 or get an online estimate today. Be sure to like us on Facebook and see more photos of projects there.